A soon-to-be-release survey by Health eCareers shows a continued upswing in health sector salaries and general confidence in the market, FierceHealthcare reports. The survey included more than 19,700 healthcare workers ranging from physicians and nurses to executives, IT personnel and social service workers. Of those, 87% reported making as much or more than last year. Average pay for healthcare executives increased 18% to $158,637. Nurse practitioner and physician assistant salaries rose 2% to $102,523 and $108,311, respectively, while physician pay edged up 1% to $258,039. 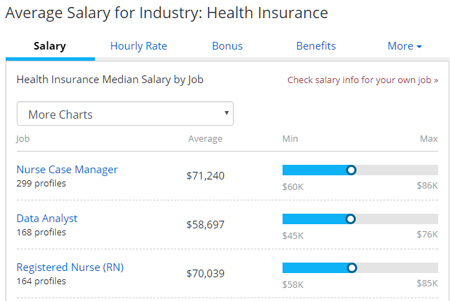 Salaries for nurses grew 5% to $70,734. When asked about their chief worries in the coming year, one-third of respondents cited increased administrative burdens and patient load -- echoing recent studies on physician satisfaction and burnout. A few conclusions that may be drawn from the 2017-2018 "Nursing Home Salary & Benefits Report," the largest annual survey of long-term care professionals. Among all facilities that participated in the survey, the average annual salary of administrators increased by 4.5%, to $106,594, while salaries of assistant administrators plummeted by more than 9%, to $61,648. Directors of nursing fared reasonably well with an increase of 3.1%, to $92,822. Oncology: Failure to address site of service issue; Failure to address reimbursement reality; Unnecessary and/or poorly constructed PSAs: Call and coverage, Lack of an accurate denominator and Rate calculation; Failure to recognize a competitive offer; Too many low dollar incentives; Failure to adjust for a lack of call; Compensating physicians for APC work effort; Failure to manage bad behavior. Changing physician compensation plans is inherently difficult, but especially toilsome as reimbursement mechanisms continue to transition away from fee for service (FFS) and toward value-based care. First, Before you make radical changes, employed physicians as well as their leaders need to understand the basics of how their organization makes and spends money under its current value paradigm. Second, even though compensation linked to meeting certain metrics is often called a "bonus," physicians count on receiving it. The more metric-driven a comp plan, the more the program becomes, in the eyes of the law, essentially a commission. And a commission is considered to be wages. Third, Do a Test Run. No matter how much due diligence goes into creating a compensation plan, unintended consequences occur frequently. But a trial or shadowing period before implementing a new plan fully can help iron out some kinks. Recently, a research group at the Neuroleadership Institute (where we are senior leaders) studied 27 companies that had gotten rid of formal ratings and were between two and five years into their new performance management framework. And of the 22 firms tracking employee engagement, all of them found that it went up after the new system was in place, and it has continued to do so. We consider the journey to reimagine performance management positive when managers are having more conversations with their team members about performance, these conversations are higher quality than the annual assessments they replaced, and engagement is going up -- not just in the first year, but in the second year as well. This standard was met by every organization we can find that took three steps. The first step is having a framework to encourage regular conversations. Firms that are succeeding at this transformation don't just remove ratings and tell managers to discuss whatever they want, whenever they want. They are putting explicit expectations in place, such as requiring four conversations about goals. Many firms provide guidance on the kinds of questions they want managers to ask in these conversations. The second step is to ensure that the conversations focus on the future, and are not just the same old assessment discussions but now without a ranking. The third step involves some kind of change management, such as training both managers and employees to have quality performance conversations; providing just-in-time tools, conversation guides, and continued focus; and consistent messaging from senior leaders throughout the organization. What Is Your Workplace "Harvey Weinstein?" Who is making the employment decisions, you or your outside background check provider? This interactive and lively webinar will raise awareness and knowledge of the use of consumer reports for employment. N. Alexander Erlam, General Counsel, Certiphi Screening, Inc.
Sadeq Khan, Associate General Counsel/Director of Compliance, Certiphi Screening, Inc.